The different series that comprise Nahúm Flores’ exhibition Delineating Margins are permeated by the artist’s ongoing commentary on the varying latitudes that embody the conditions of migration. At times subtle, and in other moments more direct, these small scale mixed media works — both in their inherent physicality and the thematic content they express—address the physical and emotional vagrancy associated with transitional states. Each series, which is made up of many individual works, is indicative of Flores’ diaristic process, the result of which allows the viewer to read them individually or collectively. Layers of meaning are subtly revealed through the build up of mixed media, wherein the artist combines organic pigments, sand, dirt, ink, and acrylic with both drawing, and photographic transfers to create ongoing series’ that are subject to change and evolve over time. The presence of fluidity and mobility are not limited, however, to the metamorphose of Flores’ artistic process and its material results. The cast of characters present in each series that emerge from the artist’s subconscious wanderings also appear to be lingering in a constant state of flux. Los errantes, 2013 comprised of ninety mixed media drawings that combine text and visuals, feature amorphous characters that occupy desolate settings. Echoing the title given to them, the characters in the series appear to be drifters, allocated to no specific environment or time. Instead, they constantly migrate between physical states, often leaving them disproportional, two headed, fractured, and bandaged. At times, Flores makes them the center of their own universe, reaching the edges of the frames with hubris, and in others they disappear into the background, appearing at any moment to potentially wander away into the distance. Regardless of the different phases of physical transformation that make each character distinct, what ultimately unites them is the dislocation—the no place— that is the result of their migratory process. The series Dwellings, 2013, similarly contributes to the tension Flores explores between a desired stability of a fixed environment and the opposing force of shifting placeless-ness. 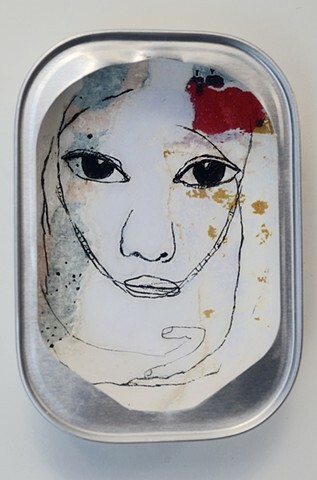 Composed of twenty mixed media drawings set in sardine cans found on daily walks and travels, the characters that peak out of these tins wear mask-like faces, appearing to conceal their true nature. Whereas the presence of characters implanted within found objects may communicate a sense of containment and intimacy not found in the unframed works of paper, an undercurrent of incongruity lingers. A dwelling or home is associated with permanence, stability and a sense of place. Flores’ dwellings, however, are not static but instead are constantly moving and their material property is a product of a cycle of being found, used, recycled, and remade: ultimately fluid. Consequently, the materiality and execution of Flores works found in this exhibition, as well as characteristic of the artist’s larger oeuvre, becomes one of the means through which he addresses the cognitive and physical experience of encountering the theme of migration. Manipulation of composition, scale, mixed media— as well as the conscious combination of individual works that function as part of a large whole—serve as crucial components in communicating the spatial, temporal and cultural concerns that characterize a migratory process. As a result, the viewer is left to ponder the state of flux and fractured nature of Flores’ characters, thereby valuing the desired stability we infuse in a sense of place — without which, we too are left in an unnerving state of transition. Nahúm Flores feels the need to communicate about his life experience through art. Many artists are content to develop a recognizable style and identity but he has the deft touch of authenticity. At once humble and humorous, he explores issues of life and death, colonization and displacement in a poetic manner, through his subconscious. It is important to realize that he comes from Honduras, a region populated by the Mayan people and other aboriginal groups over time. These Pre-Hispanic cultures all left their mark but perhaps none with as much devastation as the Spanish Conquistadores who, in misguided religious zeal, burnt all the writings and attacked the cultural bedrock of the indigenous people. Only fragments survive of Popol Vuh, the ‘Book of Councel’, which outlines the rich animistic narrative that informed indigenous rituals and beliefs. Many Gods presided over continuous celestial and terrestrial cycles of birth, death and renewal. They tried three times to invent a ‘workable’ model man to inhabit a region conceptualized as ‘underworld’, ‘earth’ and ‘heaven’. Mother Earth was seen as a living conglomerate of alligator, turtle, and toad. In the final attempt, man was constructed out of corn and four animals were singled out, the coyote, crow, mountain cat and parrot. The crow was seen as the messenger of the God of lightning and thunder. This bird features in many of Flores’ paintings, along with many images of shifting identity. Although it is a character drawn from this rich mythology, Flores is not simply illustrating the past. He interacts with his subject matter intuitively, allowing the personalities to emerge. Forms are fluid and lines that delineate a human can also denote snake-like qualities, depending on visual clues. Feminine and masculine forms flow together, amorphously, generating a place for the viewer’s imagination. Mayan language combined phonetic symbols with logograms in a system of glyphs, written on bark paper. A close look at Flores’ art reveals an obsession with text and texture, particularly of walls, bark and earthly substances like sand, rock and dirt. All elements are recycled and given new life. He uses text both as a visual element and as a ‘dialogue’ within the painting. Scavenging worksites for discarded materials, Flores re-purposes aluminum, plexiglass and wooden offcuts, or with greater ingenuity, sardine cans and flattened soda cans. The process comments obliquely on our Western society that is so wasteful of resources. Another aspect of Flores’ background is that he is part of a diaspora of displaced people. The border region he comes from was embroiled in the Sandinistas / Contras power struggle, sponsored in part by cold war ideologies. Individuals endured much suffering and this core of understanding is at the root of Flores’ work. He has empathy with the living struggle, which his work exudes as a gentle expression rather than polemic. In his teens and alone, he migrated to Mexico, the US and finally found a home in Canada. Life is extremely hard for migrants and the work undertaken can be backbreaking. Flores has endured this and completed a degree in art at OCAD. This is an achievement in itself. Flores employs a complex process of accretion in his work. He combines drawing with photography and found materials in mixed media paintings, seeking to draw out an image intuitively. Photographs of crumbling walls in Mexico and Honduras adorned with discontented graffiti from an ensuing social struggle are transferred to his canvases using a gel medium. The paper is scratched off to leave the emulsion embedded in the painting surface. Transparency is built up in areas to a glass-like consistency as he plays with a perception of depth within a flat surface. He writes short sentences on the paintings, drawing animals and birds like crows and vultures, significant to Mayan culture. The paintings seem to carry a narrative as if Flores is communicating something metaphysical in an ongoing drama about life and death. Los Errantes, or The Drifters, embodies Flores’ personal and historical journey. A work like “Homage to Non-Conformity’’ is a border crossing referencing the migrant experience, but it is also a counter-invasion by ‘aggressive tongues’. The outstretched tongue is symbolic in Toltec mythology and is a feature of serpent deities. There is a lot of humour in this visualization, as the US flag disintegrates in reverse, becoming part of the ground. In other works the small, drawn figures seem overwhelmed by the monochromatic ground. One senses an existential struggle to register as a person or thought within the overwhelming flood of history. Yet, the growth metaphor succeeds like a leaf sprouting from a corpse or a spiral line indicating a movement towards life. Some works are more overtly optimistic as if the artist is willing elements into life, defying death and the anonymity of an impenetrable background wall or rock. ‘Triumph of the Myth’ presents a crow perched on the nose of a severed head that is bandaged. The flat, textural structures within the picture plane are contrasted with the blue square, which indicates a movement towards the ‘beyond’. Mayan myth is referenced in the severed head, perhaps symbolizing the Maize God, Hun Hunahpú, whose head was cut off in the underworld yet he managed to impregnate a maiden by spitting into her hand. She later gave birth to the Hero Twins, thus becoming a source of renewal. Flores is one of the most interesting Latin American artists working in Toronto. He is also part of the collective called Z’otz*, which is Mayan for ‘bat’, another important mythological creature. He works alongside Ilyana Martinez and Erik Jerezano creating collaborative works that have received a great deal of attention in numerous exhibitions across Canada. They share an animistic sensibility, drawing content from indigenous cultures that are somewhat foreign to the Canadian sensibility. Our artistic culture is more comfortable within landscape and the US-dominated ‘modernist’ discourse. We have forgotten our own European animistic mythologies, replacing the gnarled and clawed tree-spirit of renewal with the ‘benign’, rosy-cheeked Santa Claus of commercial exploitation. Religious proselytization colonized pagan ways of mythologizing the environment in a way that has robbed us of an innate empathic relationship with nature. This seems due to the religious narrative that ‘man has been given dominion over all creatures’. Artists like Flores present an environment that lives and breathes free from these restrictions. His vision offers the possibility, through storytelling, of finding a new symbiosis with all life.